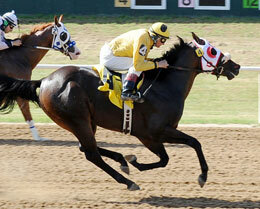 Cute Ivory James, under jockey Randy Wilson defeats Furr Bayou in the Kansas Jackpot Futurity trials on Saturday. CLAREMORE, OK�AUGUST 23, 2014�American Quarter Horse racing got underway Saturday off-the-card at Will Rogers Downs with 10 trials for the $25,000-added Kansas Jackpot Futurity. The 10 fastest qualifiers will return to the Claremore racetrack on Saturday, September 6 and vie for the winner's share of the purse going 350 yards. Cute Ivory James won the first of two trials Saturday at Will Rogers Downs to post the top qualifying time of :18.037 seconds for the $25,000-added Kansas Jackpot Futurity. Charley Hunt saddled the IVORY JAMES gelding for owner Starlet Hunt. Ridden by jockey Randy Wilson, the brown two-year-old completed the 350 yards in :18.037 to set the top mark. It was the second win in five starts for the Jack Bannon Kansas-bred out of Tres Cute, by Tres Seis. Trainer Rodney Reed saddled Special Dark Ivory to the fourth fastest qualifying time for owners Ann Pasquaili and Joyce McClennen. Agustin Silva rode the IVORY JAMES filly out of Special Phoebe, by Special Effort, to an :18.177 clocking. Vaughn and Jill Cook is the breeder. For a complete list of Kansas Jackpot Futurity finalists, times, sires, dams, owners, breeders, trainers and jockeys CLICK HERE.